Newswire #40 – 8th October. Your weekly roundup and update of Anime Limited related news. Scotland Loves Anime begins tomorrow and we are the official sponsor of the event, but that doesn’t stop us bringing you all the latest news direct from Anime Limited HQ. Read on below for all the latest updates. ~ First of all our Limited Edition Blu-ray of Tokyo Ghoul is available now! You can get the full details on our release HERE. ~ Speaking of our Limited Edition Blu-ray of Tokyo Ghoul, we want to reiterate that all stock is currently in circulation with retailers. So if you’re planning to buy it, it is starting become scarce. Though we will have some units available at MCM London Comic Con, it is sold out on our shop and also appears to be sold out with other retailers as well. In light of the Limited Edition version already becoming scarce, we can today confirm we are already planning a Standard Edition Blu-ray release of Tokyo Ghoul. So if you’re not able to get hold of the Limited Edition version, fret not as a standard Blu-ray is on the way. We’ll have more details on this soon. ~ In case you missed it earlier today, we announced that we have licensed the series Comet Lucifer. It’s simulcasting at Viewster.com. Read on below in the Simulcast Update section for more details. Please note there has been a small change to the lineup, concerning the representative from Sunrise. Due to time constraints on the day, the originally proposed post-screening panel (after Gundam Origin II) will now be taking place as its own panel at MCM London Comic Con (date/time TBC.) We apologise for the change but this was unavoidable. We will add that there will be short turnaround time in between each block. This is to allow cleanup time after each screening. Also, we have been informed that food & drink cannot be brought into the venue. So we are going to be updating the F.A.Q. section of cinema.AllTheAnime.com to reflect this. However there is a café inside the venue where light refreshments will be available. There are course shops outside of the venue as well should you want to step out to get some fresh air. There is going to be an update on the F.A.Q. section in general next week, so please keep an eye out for that. ~ And now for a few date changes to make you aware of. First of all, Beck: Mongolian Chop Squad has been pushed back, but we’re unable to confirm a new date at this time. This is due to a issue with the masters, hence why we can’t give a new date at this time. And secondly, Fusé: Memoirs of a Huntress is also going to be pushed back, again we’re not able to confirm a new date at this time. The reason for this is simply that there was a delay in the production of this title. Our release schedule has been updated accordingly to reflect these. As mentioned above, tomorrow (Friday 9th) sees the start of Scotland Loves Anime in Glasgow at the GFT and we (Anime Limited) are the official sponsor of the event. 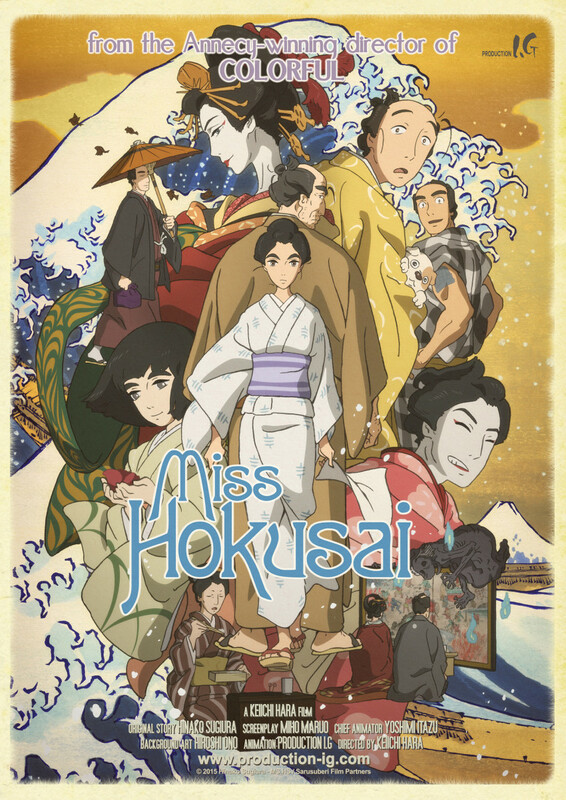 The UK Premiere of Miss Hokusai this weekend in Glasgow will feature director, Keichi Hara in attendance. And Anima(tor) Expo screening in Edinburgh will play host to two people involved in some of the shorts being screened. It’s a packed lineup of films! Do keep an eye on the official Facebook and Twitter pages of Scotland Loves Anime for updates during the festival. We will also be posting lots of updates throughout the festival on our own channels. Seraph Of The End: Vampire Reign (2nd Season) has yet to start airing. Expect the first episode to be available next week. The first 11 episodes of Blood Blockade Battlefront are available to watch at Viewster HERE. There will be a simulcast of the final episode coming soon. Please stay tuned for details as appropriate. The latest round of confirmation messages were sent earlier this week. We’ve had lots of applications over the last week so there is a bit of a backlog to work through. We are planning to have details on how this replacement scheme will be handled within the next week. Please keep an eye out for this information. Here’s the list of upcoming events we’ll be attending. More specific information will be posted closer to the events themselves. Here is the most up-to-date version of our release schedule.